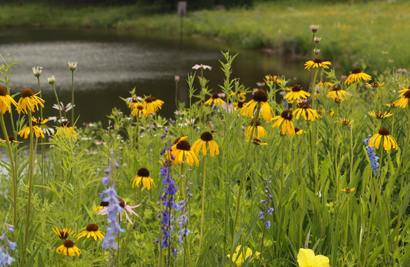 Native plants have many secrets every landscaper can learn. Each species has a specific set of growing conditions(moisture, amount of sunlight, amount of competition) under which it will thrive. Assess the site and choose species that are adapted to the site. Or, the site can be altered; remove topsoil to make it drier, or add organic matter to make it moister. Remember, growing plants where they are not adapted will either create a high maintenance landscape or the plants will not thrive. Mother Nature doesn't like bare ground; so cover her! Many weed seeds are triggered to germinate by sunlight, so make sure bare soil is not exposed. Use a component of grasses with any wildflower mix to shade the ground in between the wildflower plants. A native landscape can provide great habitat for native pollinators. Bring nature to your home by planting a mix that will bloom from spring through fall. The Dry'n Rocky, Prairie Patchwork, and Shadows and Sunbeams are all fine choices, or for added emphasis on pollinators, use the more diverse but taller and less tidy Butterfly and Hummingbird Mix for all or part of the planting. Getting rid of existing vegetation and seeds in the soil is usually the most important step to ensure a successful wildflower planting from seed. For more information check out our planting timeline. If you aren't sure what to plant, take a look at our mixes or use our mix suggestor to see what we would recommend.